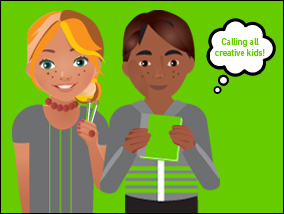 Kids Think Design invites young designers to share their projects on our website. We will feature outstanding student projects regularly. Submit your original environmental projects. MEET A DESIGNER: Frederick Law Olmsted, the father of American landscape architecture, is best known for designing New York City’s Central Park. Olmsted saw his profession as a way to shape the future of American cities by incorporating nature into the urban landscape while creating a space to meet the city’s recreational needs. Meet Frederick Law Olmsted. Sunny weather makes children feel like heading to the nearest outdoor playground. Traditional playgrounds are fun, but they can be even more interesting when kids have the opportunity to create their own play space. David Rockwell, founder of the architecture firm Rockwell Group, partnered with KaBOOM!, a non-profit organization, to create the Imagination Playground. 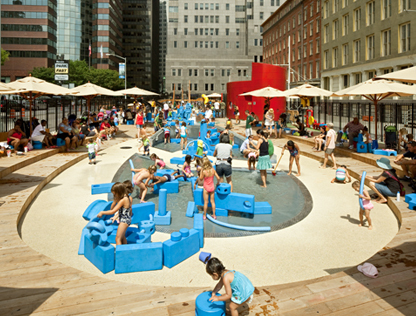 The design encourages child-directed, unstructured free play. Instead of stationary slides, monkey bars and swings, this playground is made of moveable parts — giant foam blocks, mats, wagons, fabric, crates, as well as sand and water. Children can constantly create and recreate their environment. They can work together with new friends to build a tower, fort, tunnel, castle, maze or any other creation their minds can dream up. The possibilities are endless and so are the benefits. Not only are kids exercising their bodies, but also their minds and imaginations. Related story: Kids create their own edible garden.